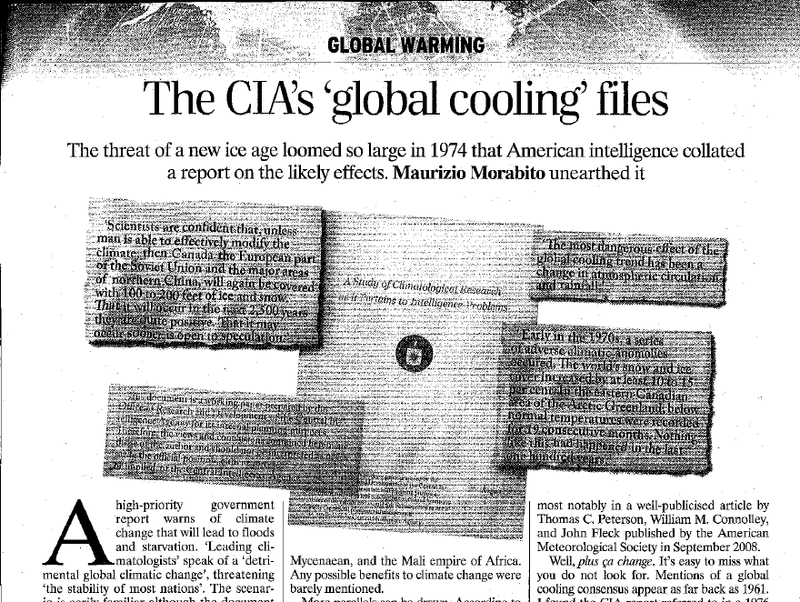 An eye-opening “global cooling consensus” CIA document dated 1974 has just been re-discovered in the British Library by Yours Truly and is extensively mentioned today in the (printed) pages of The Spectator (UK) and Il Foglio (Italy). And there is more (much more), from ever-improving climate models promising to become good in a few years’ time to the unsettling apparent ease with which Government agencies then (as now) could get scientists to agree on whatever they needed them to agree on. Nobody aware of the CIA document’s contents should be able to avoid a good chuckle after reading any of the current AGW reports on famine, starvation, refugee crises, floods, droughts, crop and monsoon failures, and all sorts of extreme weather phenomena; on climate-related major economic problems around the world; on Africans getting in climate troubles first; and so on and so forth. Why? Because it is all too clear that those scares cannot be real, since they have already been mentioned verbatim in all their dramatic effect, but about Global Cooling. The whole lot of them, they are just empty threats, instruments of doom-and-gloom policy manipulation with no relation to reality. It is deeply ironic that it takes a 35-year-old document, available on the web so far only in title, to show the absolute vacuity of the vast majority of pre-COP15 reports and studies. It is time to ditch everything we hear about collapsing ice sheets, disappearing glaciers, species extinctions, and each and every “it’s worse than we thought” report by “scientists”. It is time to become climate adults. This might be the most important lesson of the 1974 report on global cooling: that we need to grow up, separate climatology from fear, and recognise – much as it pains politicians and scientists – that our understanding of how climate changes remains in its infancy. As I wrote a little more than a year ago: “Widely accepted”: check. “Global cooling”: check.. There was a global cooling consensus among scientists, at least up to 1974. And it went on to appear in Newsweek, The Washington Post, The New York Times and many more media outlets around the world, at least up to 1976. Very interesting document both the certainty of continued cooling as well as the state of climate science in 1974. Also the unaltered temp data from the time. Good find !!! How does a 1974 CIA report trump thirty years of subsequent global warming observations? This blog makes no sense at all. Observations will look just as bad in 40 years’ time. Pingback: Oh, The Cure For Global Warming Is...Pollution?? Whaaaaa? Some comments have been that the blog is too frivolous. I assure you that it is dead serious although it starts off with some incisive satire. All the facts are supported, each one by usually more than one authoritive source and the conclusions are sound and logical. I also allow any comments, unedited, including those of opposing views (although I may ask for references to back up any claims) and only draw the line if there are too many obscenities etc. I think it is a must see for anyone who is considering the issues of climate change with an open logical mind and I recommend that everyone should lobby their local TV station to have it aired in prime time. There might be global warming or cooling but the important issue is whether we, as a human race, can do anything about it. There are a host of porkies and not very much truth barraging us everyday so its difficult to know what to believe. I think I have simplified the issue in an entertaining way on my blog which includes some issues connected with climategate and “embarrassing” evidence. Please feel welcome to visit and leave a comment. Maurizio, thanks for the answer. One comment and two questions. I have now discovered, that in the 1970s the CIA wanted to know a lot about the climate ans weather all over the world. I still have no access to the documents. But they can be requested via the Freedom of Information Act (FOIA). (1) Who has requested the CIA document “A Study of Climatological Research …”, which is available for the public at http://www.climatemonitor.it? (2) From whom did he/she get it? That report is very interesting – not merely for its chuckle value, but also for its far more accurate analysis of the effects of Global Cooling, which have been very harmful. The irony of todays situation is the world insanely committing economic harakiri to ward off some mythical danger of man-made global warming, when warm periods have always been beneficial and trying to cool the world, which will be enormously harmful. That pdf report is a scanned document. Is there anywhere where the text has been transcribed? So we’re supposed to take the word of some […] about all of this? There was no consensus. Not even close. Novenator – if anybody is willing to seriously discuss the topic in light of everything we know now, I am here to talk. If anybody can show any document contradicting the notion of a global cooling scientific consensus between 1972-1975, please do it. Everybody else, repeating false prejudices despite all the evidence presented here and by Peterson, Connolley, and Fleck, shows himself or herself as a (sad) clown. I thought global warming = global cooling? With all the ice melting and fresh wather saturating the salty atlantic ocean this would cause a gradual cooling of the northern part of the world. I have a seen many programs on TV showing how this melting ice would effect our climate…Cooling not warming! I was born in 1968 and remember being taught in grade school that we were on the verge of a new ice age. As a little kid I imagined growing up to live in an ice cave and fighting saber toothed tigers. I think it was irresponsible for teachers to scare children like that. I remember thinking that there was no reason to work hard in school, my future was doomed anyway. The CIA report identifies the Univ. of E. Anglia (in 1972!) as the center(!) of the paleoclimate reconstruction approach to climatology, using tree-rings (!! ), etc. The work was conducted by H.H. Lamb at that time, certainly a more creditable scientist than the current crowd at UEA. very interesting report and congrats on the spectator article. Good, another climate blog that is coming out with hard facts about how all of this AGW crap is being bandied about to justify globalizing America’s economy (let’s be real: no one cares if the Euros destroy their economy, but everyone wants a piece of the American economy any way they can get it). I’m linking this page over at my blog, chrisbolts.wordpress.com. Thanks for being there and bringing light to this issue. What about “The Weather Machine and the Threat of Ice” published in 1974 by the BBC and written by New Scientist Editor Nigel Calder. You cant get any more main stream than that! Romanoz – the usual reply to that has been so far “it was just a journalist”. Not any longer. Have you considered the possibility that both global cooling and AGW are correct? That it was the CO2 released into the atmosphere by people that prevented the cooling, so decreasing our CO2 output too much would allow the cooling to begin again. Shouldn’t we be trying to save future generations from the threat of the next ice age? Don’t these people that want to limit CO2 care about the consequences? Are they so heartless that they will allow their political/social goals to doom the world to an icy future? As you say, the recent Petersen, Connolley and Fleck article set the goalposts so close together that it would be virtually impossible to kick the goal of proving a 1970s consensus on global cooling. Which begs the question: is there a global warming consensus now, if we define that as narrowly? Very much doubt it. The equivalent statement would be something like: “there is a consensus among climate scientists today that dangerous anthropogenic global warming (AGW) is imminent’. That is nothing like what even the IPCC says. Moreover, the various petitions signed by scores or even thousands of scientists who reject the AGW scare, and other measures such as the 450 sceptical articles listed at Popular Technology, show it is false. Both AGW now and global cooling in the 1970s were widespread scientific opinions blown out of proportion by the media and activitists. The level of scientific proof was about the same: none. The big difference is in the scale of the social movement and political buy-in that has built up around global warming in the 30 years since it started. I have a 1976 book written by a well respected TV weatherman “downunder”, Alan Wilkie. There are a few pages where he discusses the post 1945 “cooling”. There are a couple of pages on ‘Our Changing Weather Patterns” mentioning various gloom and doom effects, crops, droughts etc, eerily similar to modern speculations where any unpleasant phenomena are attributed to AGW. I must scan these pages and get them up. Climategate has brought too many tasks. Well done, this is an interesting finding and it’s great to get it published in The Spectator. Have you (or anyone else?) been able to find the NAS report that came out in 1975, “Understanding Climate Change: A Program for Action”? The wiki article on global cooling has a link, but amusingly it goes to the page of the chief history-denier himself rather than the real report. In fact one does not need to go this far to expose the falsehood of Peterson Connolley and Fleck’s claim that there were only 7 scientific papers predicting cooling in the 1970s. I spent just a few minutes on Google scholar and found several more that they had somehow not come across. Return of the ice age and drought in peninsular Florida? Joseph M. Moran, GEOLOGY 3 (12): 695-696 1975. Convection in the Antarctic Ice Sheet Leading to a Surge of the Ice Sheet and Possibly to a New Ice Age, T. Hughes, Science Vol. 170. no. 3958, pp. 630 – 633, 1970. His reply was “We weren’t looking in Geology-type journals” and that he thought the second one was “misleading”. Well done, this is an interesting finding and it’s great to get it published in The Spectator. Have you (or anyone else?) been able to find the NAS report that came out in 1975, “Understanding Climate Change: A Program for Action”? The wiki article on global cooling has a link, but amusingly it goes to the page of the history-denier himself rather than the real report. W is better than most but I do not think he will ever be able to admit his own limits. And that’s the biggest limit of them all. The Peterson, Connolley & Fleck (PCF) paper investigated the following carefully defined myth: that ‘there was a consensus among climate scientists of the 1970s that either global cooling or a full-fledged ice age was imminent’. Consensus – climate scientists – imminent. In a less hair-splitting mode, I’ll add that, although the CIA document demonstrates the truth of the myth that global cooling was taken seriously in the 1970s, it doesn’t reveal the emptiness of AGW scares. You’re overselling. My finding doesn’t overturn PCF’s self-stated conclusions because at the end of the day there is nothing to overturn. As you say, their definition of “global cooling consensus in the 1970’s” means it would not have been possible to find a positive answer anyway. It’s like narrowing the goalposts to less than a football’s radius, and then “demonstrate” that the opposition is unable to score due to its own fault. That’s why I refer to PCF as “largely mistitled”…what is good of it, of course, is that it provides a nice review of how climatology evolved in scientific journals between the mid-1960’s and the early 1980’s. 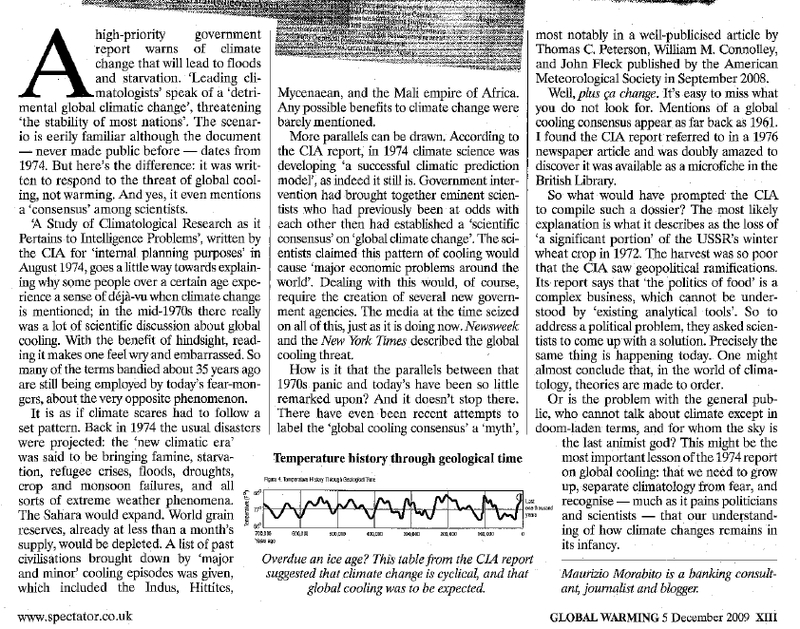 And so rather than “disproving” PCF, I can rightly use it to close my case, as second piece of evidence that there was global cooling consensus in 1974 (according to PCF, things changed in 1975…I presume that in a world without internet one cannot fault the journalists if they allowed popular perceptions to “linger on”). Why do you talk about “influential non-climate scientists”? AFAIK, the San Diego conference was attended by climatologists too. As for the emptiness of AGW scares, those that were banded about in 1974 regarding cooling are for all intents and purposes logically dead at the moment. They need to be re-analysed individually to understand if there is any merit to them or if they show up just because the thing that hasn’t changed, in 35 years, is human nature. This is highly interesting, and thank you very much for posting it. How many times do we get told that the global cooling scare in the 1970s was little more than a few people’s speculations plus a certain issue of Newsweek? On RealClimate there is a page about the “global cooling myth” which tries to dispel the idea that scientists were seriously predicting cooling. But I think the RealClimate writer misses the point. What is clear from the document is that even though scientists at the time were very aware of the need for more research and better long-range forecasting, there was a basic consensus or understanding among them that the world was cooling, or as the report puts it: “The Wisconsin forecast suggests that the world is returning to the climatic regime that existed from the 1600s to the 1850s, normally called the neo-boreal or “Little Ice Age.” (page 25)”. * A global climatic change is taking place. * We will not soon return to the climatic patterns of the recent past. * For the future, there is a high probability of increased variability in a number of features of climate that are of importance to crop growth. A couple of observations; firstly, “consensus” – looks like there was one, after all. And “long-range” was 1-5 years – how modest they were in those days! Here in Australia (Melbourne at the time), there was a marked cooling in the summer from the late 1960s or early 1970s. I can remember quite vividly the difference in the weather pattern. Yes, like the others I remember reading about the cooling scare and suddenly, voila we have this AGW scare. Unbelievable. I had just graduated from High School in 74 but remember a network special (don’t recall the network) titled “Will we freeze in the dark?” Does anyone else remember this? I believed it at the time. Good work. Having lived through the 70’s, I was aware cooling was about to happen again. It seems climate scientists haven’t moved forwards much in the last forty years and are still treating our dynamic chaotic climate as if it was just a bunch of linear processes, where the past means little and temperature trends even less. The closest to having the right approach was Dr Budyko, who was attempting to measure energy flows – shame that bunch of statistics crooks at the CRU dominate the science. The truth will always out, so please keep up the good work. Temperatures are always moving up and down, and always will do – mankind have little or no influence on this elegant but ‘messy’ system. Back around 1970 there were at least 4 reconstructions of the Northern Hemisphere’s tremperature record. They were by Mitchell (1973), Spirina (1971), Budyko (1959) updated by Asakura (1969), and Starr and Oort (1973). All of them show a marked cooling from 1940 to the early 70s. Staar and Oort, for example, show a 0.6 C cooling between May 1958 and April 1963. The cooling reported by all these authors brought the temperature down to where it was about equal to what it was between 1900 and 1910. That is quite a bit different conclusion than CRU and GISS have if you looking at their reconstructions. They are circa 0.4 C warmer. The earlier reconstructions are close to Briffa’s censored treerung MXD series that also shows 1970 and 1900 are about the same. I think theearlier reconstructions are confirmed by Briffa’s results. What I find ironic about it is that this global cooling scare is where NOAA and others got much of their budget from for their climatic and environmental assessment activities since. Thanks for sharing this. Very enlightening. This is the correct link to a PDF of the CIA document. Apologies for the mix-up. access to document is denied. There’s a prob with scribd. Another link will be provided shortly. Added the link to the CIA document. I have just added a (degraded) scan of the Spectator article. How many other distortions in science over the past three decades came from the CIA? At the AGU meeting in Washington, DC in April of 1976 we were ambushed when we tried to report evidence that the Sun gave birth to the Solar System. (That inconvenient truth has been confirmed many times since 1976). In 2001 a large group of scientists reported that solar neutrinos oscillate away before reaching our detectors. (That convenient untruth was falsified by double-beta decay measurements). Now we know how Al Gore found a title for his fairy tale of global warming!. Thanks for exposing the unholy alliance of scientists with politicians. I graduated college in 74 and also got married. The wife and I both recall the scare stories that we were all going to freeze to death in the coming ice age. That is one reason that I knew “global warming” was a fraud. Congratulations on the CIA find. I can’t wait to see the full PDF. I’ve been waiting for some kind of additional evidence from the “Global Cooling” sideshow of the ’70s. I was but a wee lad of 14 years in 1974, so I wasn’t paying close attention, but I assumed that the ‘new ice age’ doom-and-gloomers were not in the center ring of the circus as the warmers are today; hence my use of the term ‘side show’. Thanks for helping bring this to the fore. Progress!